DELIGHTING IN HIM: A Texas Surprise!! I mentioned the other day we had a surprise coming! I was being very literal. Our church flew Erinn back to Medford from Texas to surprise Devynne at church on Sunday. Erinn and Devynne have been good friends for about 4 years, and both of them were missing each other. We planned our trip to Texas to be 2 weeks after Devynnes surgery. They moved it back two weeks so we were somewhere in the middle of Arizona when she was having her surgery. When things started not to go well it was very difficult for Erinn to be so far away. We prayed a lot, remembering that God is in control of all things including the timing of Devynne's surgery and our trip. Well after her long nine week hospital stay, Devynne came home on Friday. Erinn flew in quietly on Saturday. She hid behind the curtain at church till the pastor said that the church had to go all the way to Texas to get her welcome home present. We are glad for the opportunity to see her again so soon too. Thanks Michael for making the sacrifice of time with your wife so soon after returning home. 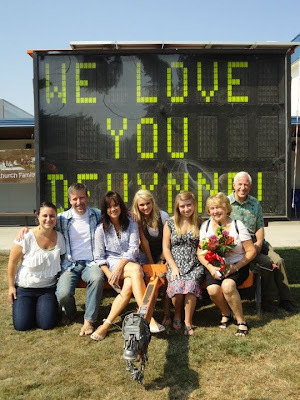 In the picture above Erinn is on the far left next to Brian and Jen, Devynnes parents, then Brenna, her sister and Devynne, then her grandparents.